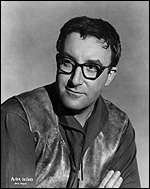 Peter Sellers, born into a touring theatrical family, became a "drummer, pianist and general funnyman" for RAF Gang Shows during the war. After demobilisation, he worked on radio as an impressionist, exhibiting the extraordinary vocal inventiveness that became one of his trademarks and was a cornerstone of radio's highly popular The Goon Show (1952-60). Sellers made two Goon Show spin-off films, Down Among the Z Men (d. Maclean Rogers, 1952) and The Case of the Mukkinese Battlehorn (d. Joseph Sterling, 1956). His other 1950s film parts were bewilderingly varied: timorous Teddy Boy in The Ladykillers (d. Alexander Mackendrick, 1955), fly Petty Officer in Up the Creek (d. Val Guest, 1958), aged, obfuscating Scottish accountant in The Battle of the Sexes (d. Charles Crichton, 1959), or Brummie villain in Never Let Go (d. John Guillermin, 1960), complemented by multiple roles in The Naked Truth (d. Mario Zampi, 1957) and The Mouse that Roared (d. Jack Arnold, 1960). The role that confirmed his acting ability was Fred Kite, the Communist shop steward in I'm All Right Jack (d. John Boulting, 1959), where his brilliant performance captured both the vanity and poignancy of this ideologue and intellectual manqué. It was this mixture of sharp observation and pathos that characterised Sellers ' ordinary men with aspirations: the provincial librarian in Only Two Can Play (d. Sidney Gilliat, 1961), the idealistic vicar in Heavens Above! (d. John Boulting, 1963). These qualities infused his most popular achievement, Inspector Clouseau, in five films beginning with The Pink Panther (d. Blake Edwards, 1963) through to Revenge of the Pink Panther (d. Edwards, 1978). In Clouseau, Sellers combined his vocal ingenuity and skill as a slapstick comedian, yet always retained an essential humanity through the inspector's indefatigable dignity in the face of a hostile universe. His other performance which endures in the memory was the triple role in Dr Strangelove (d. Stanley Kubrick, 1963), as the well-meaning US President, unflappable RAF group-captain and the nightmarish Dr Strangelove himself, the government's adviser on nuclear warfare, who is unable to control his own body, the black gloved hand always trying to make a Nazi salute, expressing an ineradicable desire to dominate and destroy. Always restless, insecure and self-critical, Sellers sought to play romantic roles as in The Bobo (d. Robert Parrish, 1967) or Hoffman (d. Alvin Rakoff, 1970), but was always more successful in parts that sent up his own vanities and pretensions, as with the TV presenter and narcissistic lothario in There's a Girl in My Soup (d. Roy Boulting, 1970). Sellers ' career meandered in the 1970s; only his role as the humble gardener turned guru in Being There (US, d. Hal Ashby, 1979) showed the range of his talent. He was married to actresses Britt Ekland (his second) and Lynne Frederick (his fourth). Biographies: Peter Sellers by Alexander Walker (1981), Peter Sellers: A Film History by Michael Starr (1991).